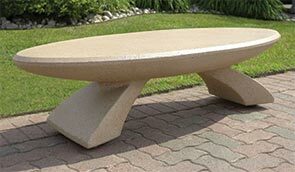 This uniquely designed contemporary style precast concrete park bench provides a visually pleasing contemporary look with the durability of steel reinforced concrete. Little or no maintenance is required on this precast concrete commercial bench. This park bench will enhance the look of any high traffic area and is available in a variety of colors with a weatherstone concrete finish. Make a decorative statement with this uniquely designed precast concrete bench. This stunningly gorgeous park bench is designed to improve any setting.